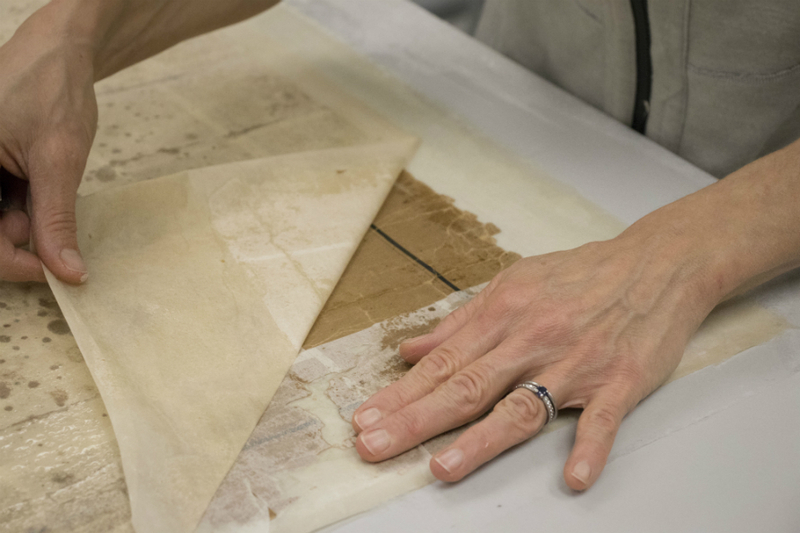 The American Library Association celebrates Preservation Week April 21-27, 2019, to raise awareness about the importance of conservation and preservation for the unique and rare items in America’s libraries. 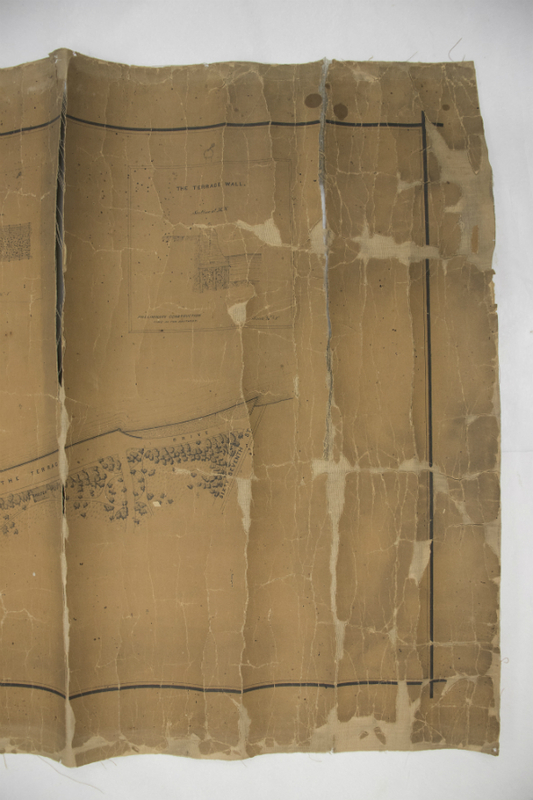 We here at Special Collections recently completed a conservation project on one of our Chicago Park District drawings, the “General Plan for the Jackson Park Shore Protection,” drawn in 1885. 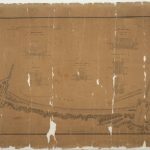 One of the oldest in our Chicago Park District collection, this drawing shows plans for Jackson Park on Chicago's South Side, which would become the site of the 1893 World's Columbian Exposition eight years after this drawing was made. 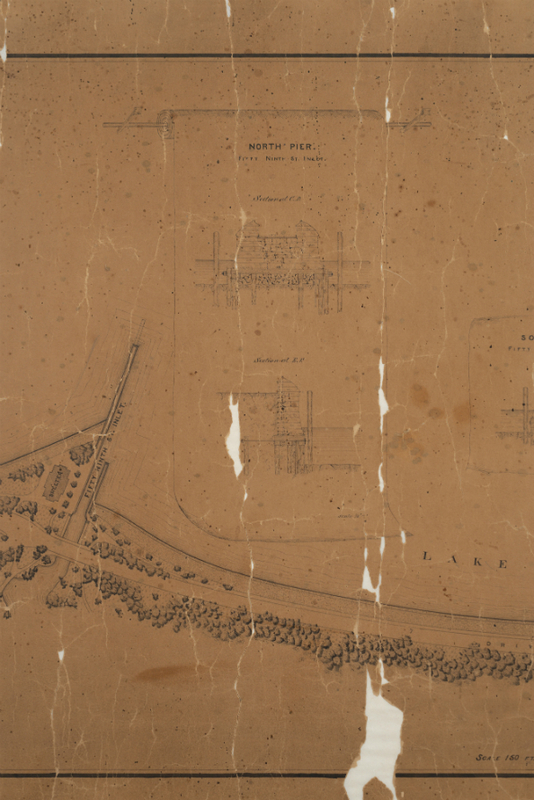 Jackson Park was designed by the grandfather of landscape architecture, Frederick Law Olmsted. 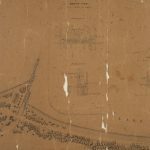 In recent years, Jackson Park has benefited from Army Corps of Engineers funding to restore parts of the park, and it's been in the news as the proposed site for the Obama Presidential Center. 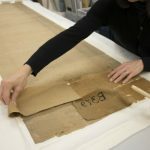 Due to this renewed interest and to the historic nature of this particular drawing, we prioritized it for preservation. 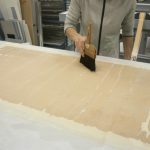 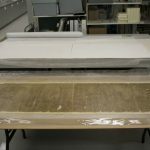 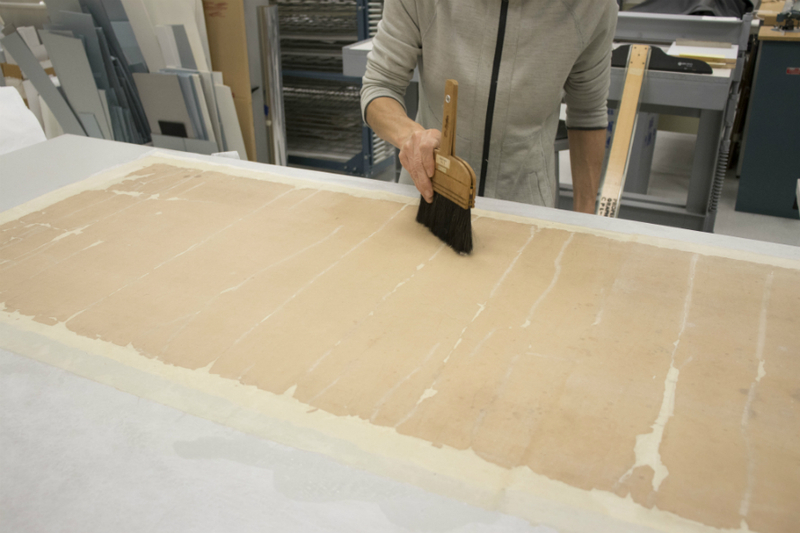 Using grant funds, we hired paper conservator, Kimberly Nichols, to treat the roughly 23” x 76” drawing. 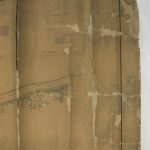 Hand drawn with ink on thick paper, the drawing was mounted to fabric and then stored on a roll for decades. 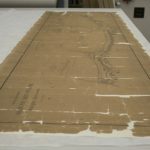 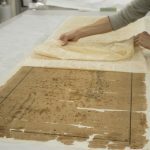 This caused the paper and mount to crack and become severely cupped when unrolled. 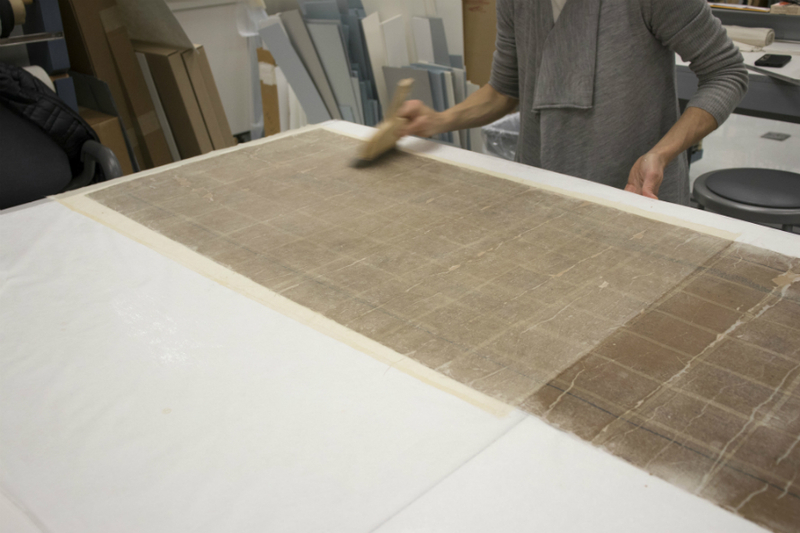 The paper was discolored, and the surface was also quite dirty. 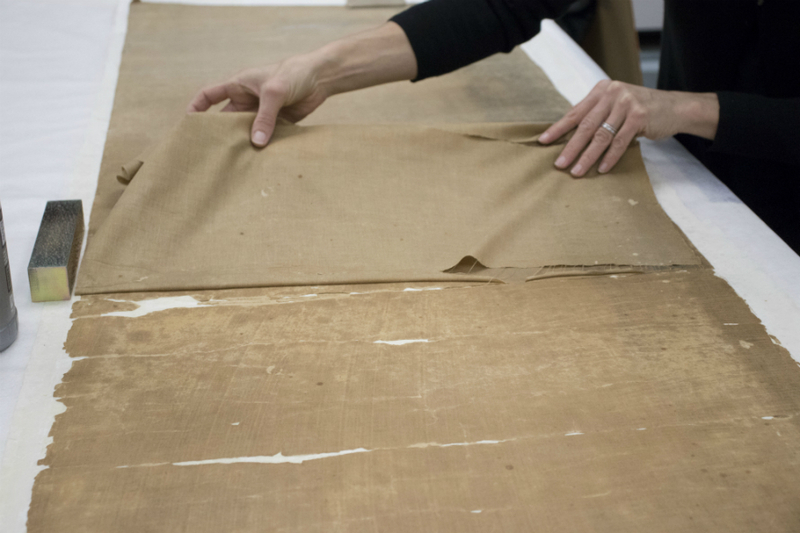 In its previous state, it was unusable because we couldn’t unroll it without further damage. 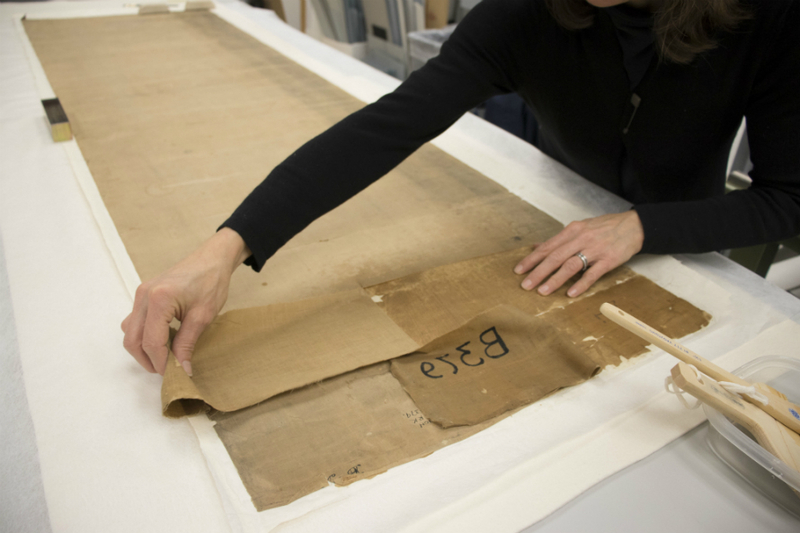 The main task was to remove the old, torn, fabric mount and replace it with a paper lining. 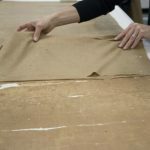 To do that, Nichols applied a temporary 'facing,' or protective layer, so that the drawing itself would stay intact during treatment. 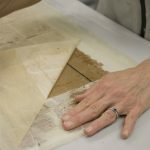 She used a series of small sections of special paper adhered with a plant-based glue that could easily be removed. 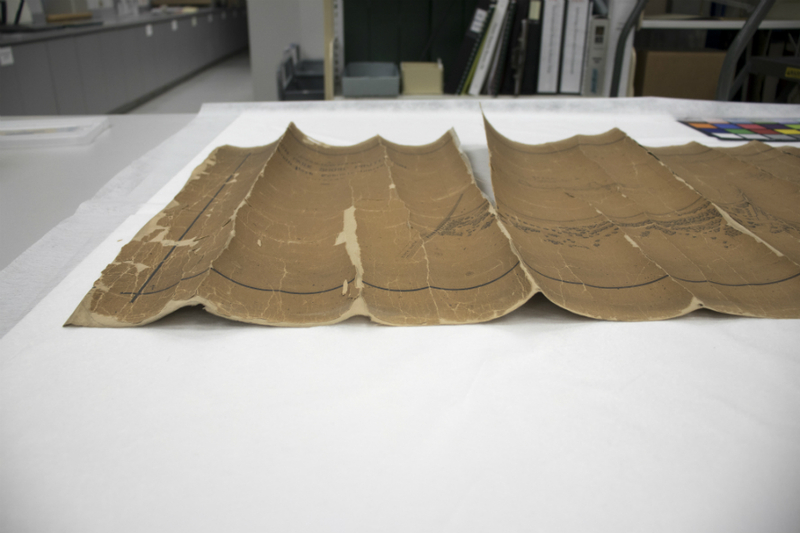 They were pasted down almost like roof shingles or fish scales. 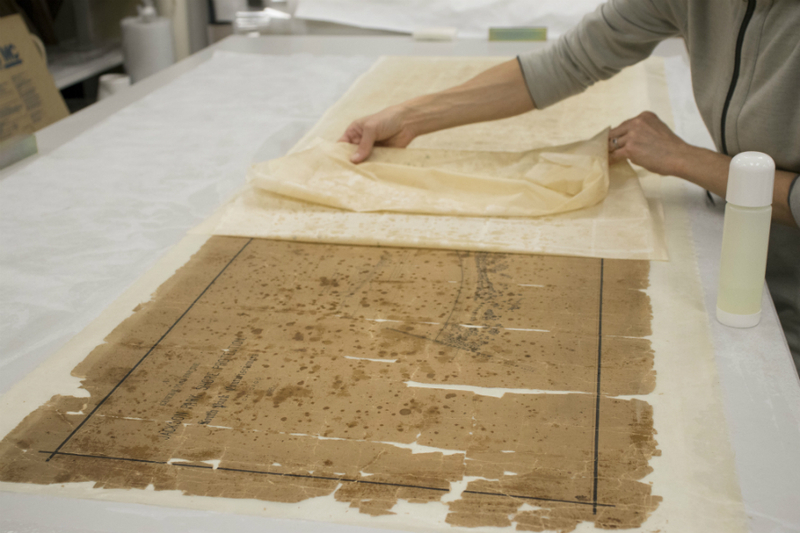 Two additional, larger sheets of paper were applied over these. 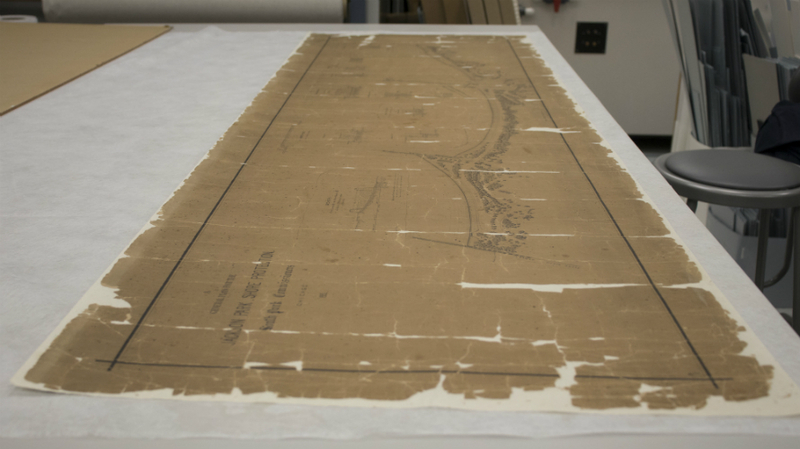 Once this new facing was in place, Nichols turned the drawing over, and removed the old, fabric mount. 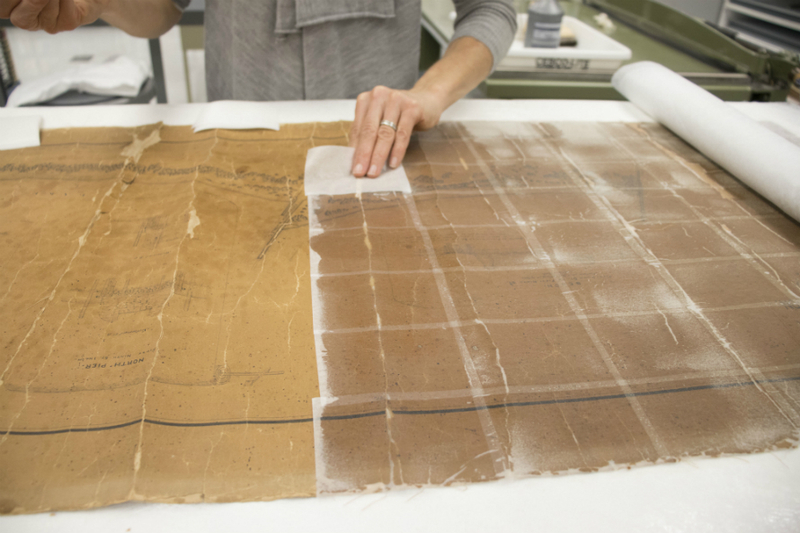 Having tested the ink to see if it could get wet, Nichols then constructed a makeshift basin out of a folded Mylar sheet, and, using distilled water, immersed the drawing in the bath to clean it. 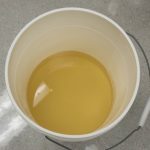 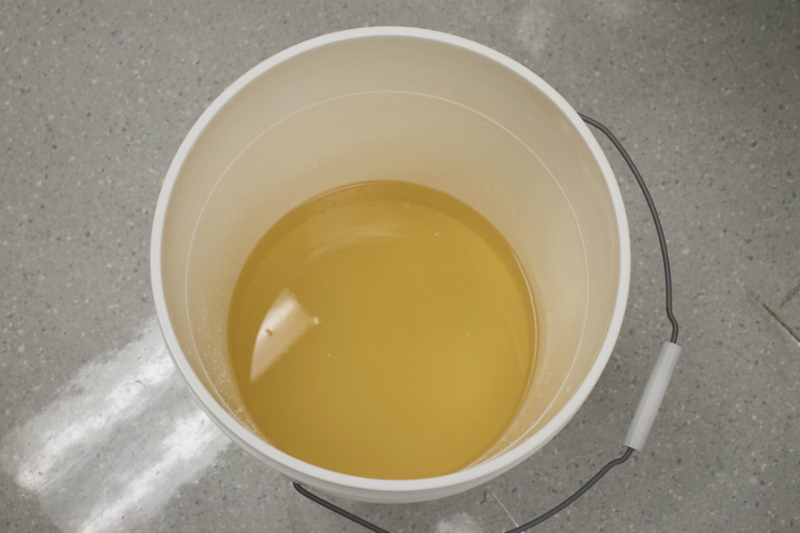 She washed it five times over two days, and each time, the bath water turned an off putting shade of yellowish brown, as dirt and discoloration seeped out of the paper. 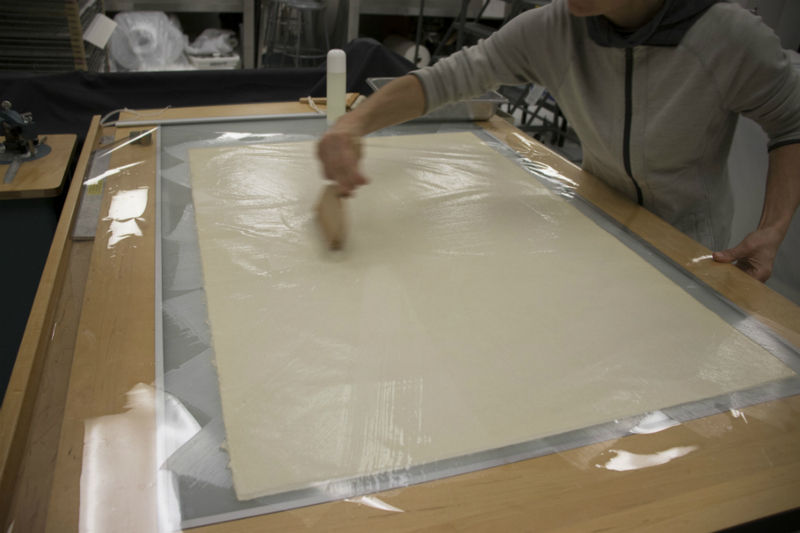 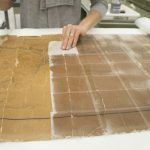 Next, Nichols created a new lining to support the drawing out of two large sheets of medium weight Japanese paper. 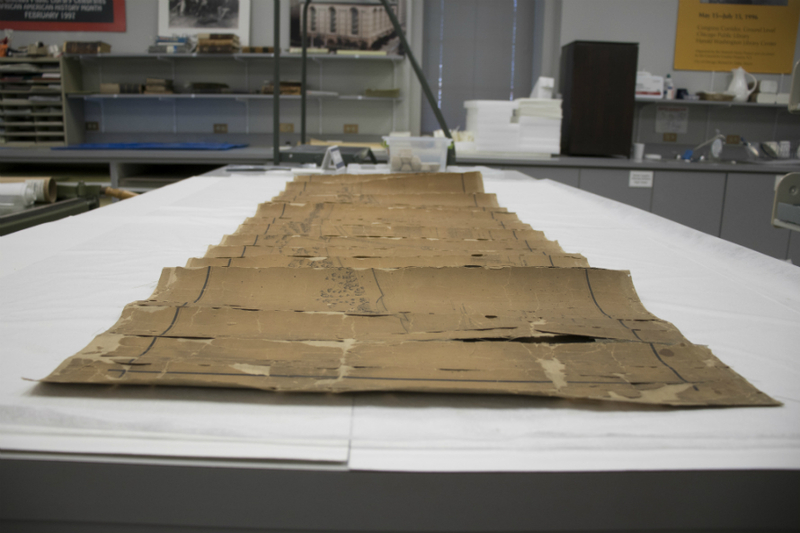 Once this was attached, Nichols turned the drawing over and removed the facing she had put on just a few weeks earlier. 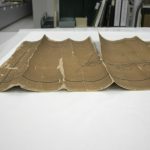 Nichols had used materials that were only strong enough to last through the treatments without causing damage, so at that point, the facing was ready to come off. 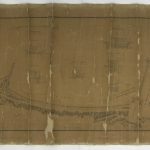 Thanks to this project, we can now handle this historically significant drawing, and most important, make it available to the public for research. 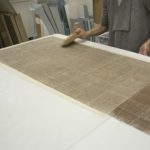 Since the drawing is so large, I was lucky enough to get to play conservation assistant some days when an extra set of hands was needed. 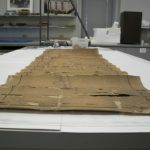 I hope I’ve conveyed just how fascinating it was to go behind the scenes. 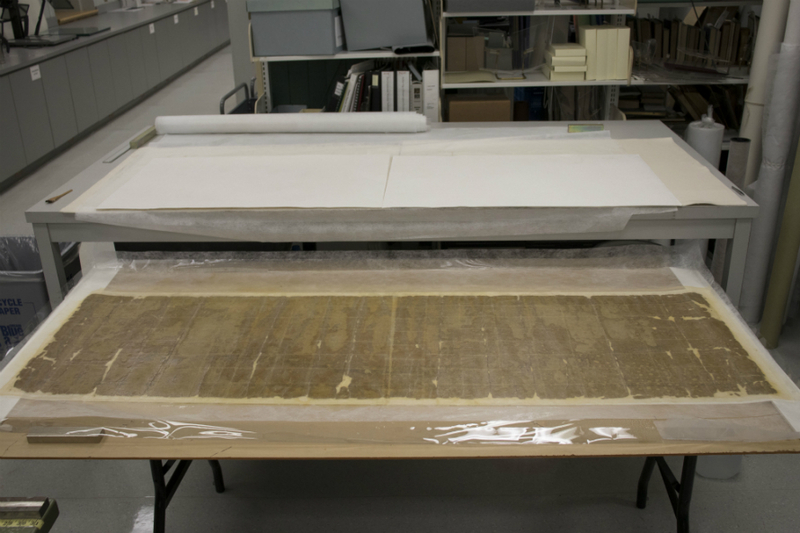 What would you preserve if you could?